Debate rages over "income inequality". CEOs makes hundreds or thousands of times more than workers. That is one aspect of income inequality. And it's easily explained: The Fed's inflation policies, bank bailouts, Fractional Reserve Lending, and crony capitalism are to blame. Rather than attack the problem, "progressive" partisans howl over minimum wages. There is one major aspect of "income inequality" that you never hear president Obama or the Democrats mention, precisely because they are to blame. Democrat-sponsored "income inequality" is even more insidious because it directly affects middle-class Americans who pay high taxes so public employees can retire in comfort with gold-plated guaranteed-for-life pensions. In support of my above thesis, please consider In San Jose, Generous Pensions for City Workers Come at Expense of Nearly All Else. Employee costs are growing nearly five times faster than revenues leading to fewer workers and budget deficits. 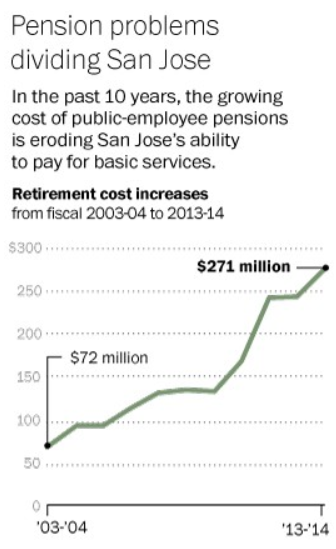 In San Jose and across the nation, state and local officials are increasingly confronting a vision of startling injustice: Poor and middle-class taxpayers — who often have no retirement savings — are paying higher taxes so public employees can retire in relative comfort. In California, cities large and small are struggling to pay the growing public-sector retirement tab. Meanwhile, 55 percent of the state’s private-sector workforce — 6.3 million — have no retirement plan on the job. Other governments are also struggling. In Chicago, Mayor Rahm Emanuel (D) has been pushing to scale back pensions for city workers, warning that without reform, city services will wither. Rhode Island enacted pension reforms in 2011 that trimmed retirement benefits for new workers and for those already on the payroll. Instead of admitting the system is hopelessly broken, Sacramento lawmakers want to create the nation’s first retirement savings plan for private-sector workers in which the state manages the money and guarantees a minimum rate of return. Both cities and the State of California are struggling to pay pensions, yet the proposed solution by California lawmakers is to have the state guarantee even more pensions. Note: John Hussman is one of many great speakers at Wine Country Conference II. If you haven't yet signed up, please do. For such ideas to be proposed at the worst time is mind-boggling, yet strictly in accordance with "The Law of Bad Ideas". A number of corollaries clearly apply. Corollary Three: Those in positions of political power not only have the worst ideas, they also have the means to see those ideas are implemented. Corollary Four: The worse the idea, the more likely it is to be embraced by academia and political opportunists. Corollary Five: No politically acceptable idea is so bad it cannot be made worse. Because of one idiotic notion, that "falling prices are a bad thing", the Fed has generally managed to keep the CPI rising, with some prices rising much faster than others. Law of Bad Ideas Corollary Six: Bad ideas lead to more bad ideas to fix problems caused by previous bad ideas. And so here we are. To bail out the absurd idea that public pension promises are supportable, complete with 7.5 to 8.0 percent annual returns, when 10-year treasuries yield 2.67%, California proposes insuring private pensions as well.